Dr. Veronica Pedro-Alexander, MD is a Doctor primarily located in West Palm Beach, FL, with another office in West Palm Beach, FL. She has 28 years of experience. Her specialties include Orthopaedic Surgery of the Hand, Surgery of the Hand and Orthopaedic Surgery. She speaks English. The overall average patient rating of Dr. Veronica Pedro-Alexander is Great. 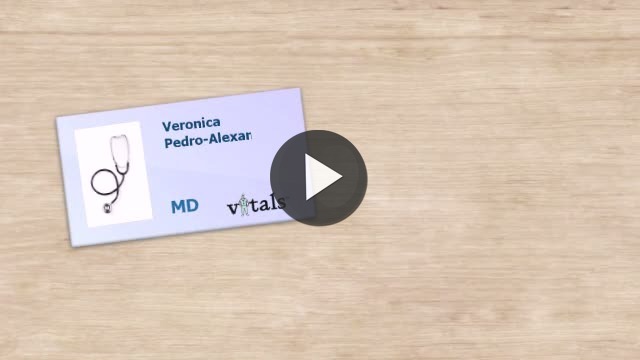 Dr. Veronica Pedro-Alexander has been rated by 32 patients. From those 32 patients 9 of those left a comment along with their rating. The overall rating for Dr. Veronica Pedro-Alexander is 3.6 of 5.0 stars. although I did not get to see or meet Dr. Pedro-Alexander I will rate her 5 STARS, because those that recommend her to me told me she is great. As for her staff they are more than worthy of 5 STARS. My appointment was for 9am, I arrived at 8:30, completed my paperwork and was receiving x-rays by 9:05, then into a room to wait to see the doctor, around 9:50 I asked to use the restroom and at that time I was told that I was the next patient to be seen. I quickly returned to my room to wait. At 10:10, I let one of the girls at the front desk know that I will reschedule and walked out. Dr. Pedro conducted hand surgery on my ring and little finger and palm area. This was the second surgery after an earlier one two years before by another surgeon. Dr. Pedro is not only an excellent hand surgeon, she is extremely kind, caring, and understanding. She explains everything in detail so there are no surprises. Her staff is top notch and makes you feel welcome throughout the process. Having worked with numerous doctors in my previous profession I am glad to give Dr. Pedro my highest recommendation to anyone in need of hand surgery. Dr Pedro and her staff have done an amazing job assisting me through a broken bone and surgery to remove it. She and her competent staff have been a pleasure to work with. Gets to the point and offers treatment. From her staff over the phone the in office staff, everyone was Amazing. Dr Pedro goes above and beyond. She consulted while at the hospital and got an appointment same day when released to see her. More doctors should be as compassionate and caring as her. Definately a keeper!!! Veronica Pedro, MD Board-Certified, Fellowship Trained Orthopaedic Surgeon Hand Surgeon Veronica Pedro, MD is a Board-Certified Orthopaedic Surgeon, Certified Independent Medical Examiner, and Certified Workers Compensation Manager with expertise in Hand Surgery. Dr. Pedro has advanced training in Upper Extremity and Microvascular Surgery. Her other areas of expertise include hand and wrist fractures, upper extremity traumatic soft tissue injuries, and reconstruction of the arthritic hand and wrist. Dr. Pedro earned her Medical Degree from Loma Linda University Medical School in CA. She completed her General Surgery Internship and Orthopaedic Residency at Loma Linda University Medical Center. In addition, Dr. Pedro performed an Orthopaedic Hand Surgery Fellowship at the University of Alabama, Birmingham. She was honored with the Janet M. Glasgow Memorial Achievement Citation, Certificate of Appreciation from Riverside General Hospital, and Leon Hess Biology Scholarship. In addition to practicing orthopaedic surgery, Dr. Pedro serves on the Board of Trustees for Palms Wellington Surgery Center and Board of Trustees for Palms West Hospital. Dr. Pedro’s research is published in peer-reviewed journals. Dr. Pedro is a Member of the American Medical Association, California Medical Association, San Bernadino County Medical Association, Ruth Jackson Orthopaedic Society, Jefferson County Medical Association, Women’s Chamber of Commerce of Palm Beach County Hand Society, Palm Beach Women’s Physician Association, Florida Medical Association, Palm Beach Medical Association, and Neufeld Society. Take a minute to learn about Dr. Veronica Pedro-Alexander, MD - Surgery of the Hand in West Palm Beach, FL, in this video. Dr. Veronica Pedro-Alexander is similar to the following 4 Doctors near West Palm Beach, FL. Have you had a recent visit with Dr. Veronica Pedro-Alexander? Select a star to let us know how it was.